Are you looking to Hire that luxury Limousine (s) in the Midland for your special occasion? if the answer is Yes then Welcome to.. If you need to travel in style, and then look no further for Midlands Limousine hire. There is nothing more entertaining by gathering a few friends and starting your occasion with hiring a super lauxourious Limousine by a Midlands based Limousine hire company. Krystal limousine hire is where you can place your trust. We operate limos for hire in the East and West Midlands covering all those special occasions. Limousine hire is becoming more popular and we have been part of this. Krystal Limo's is the fastest going Limousine hire company. Our fleet is unique and thats why our customers are happy to return time after time. Imagine you and your friends travelling in style and cruising in one of our stretch limos in the Midlands area. Our extremely popular limousines are fitted with all the luxuries one could ever wish for. You can be certain and convinced that our Midlands limousines will create a big impression when it comes to hiring limousines in the Midlands. We are the first Midlands Limo company with a Chrysler (C300) stretch Limousine that is always mistaken for a Baby Bentley Limo. 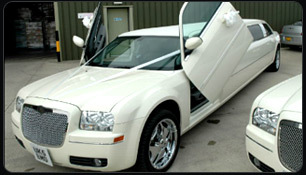 Please view our Limousine for hire selection from the above links. Our Limo fleet ranges from Lincoln Towncars, 4x4 Navigators, "Baby Bentley" (C300), H2 Hummer and coming soon the ultimate Stretched Range Rover Sport. At Krystal Limo's our staff are committed to excellence in every way when it comes to Limousines and hire, this includes our service and ongoing relationship with our customers, updating and maintaing our Limo hire fleet and maintaining your highly trained professional & courteous drivers.